The lobotomy procedure was first done by the Portuguese neurologist, Egas Moniz, who believed that patients with obsessive behavior were suffering from fixed circuits in the brain. His original technique was then adapted by others, with similar procedures. 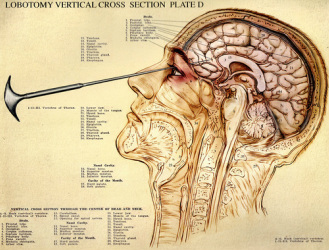 Surgeons would drill a pair of holes into the skull, either at the side or top, and push a sharp instrument - a leucotome - into the brain and then the surgeon would sweep this from side to side, to cut the connections between the frontal lobes and the rest of the brain. By the 1940's it was being seen as a miracle cure, used to treat a range of illnesses, from schizophrenia to depression and compulsive disorders. Starting in the mid-1950s, it rapidly fell out of favor, partly because of poor results and partly because of the introduction of the first wave of effective psychiatric drugs, which were safer and more effective. "I got increasingly conservative about it because I don't think any of us were ever really happy about putting in a brain needle and stirring the works," he says. "Not a nice thought."